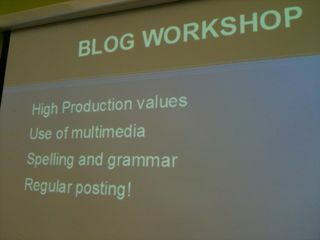 Producer Chris was on hand to provide some excellent tips on how to produce well-written, focussed blogs which are to the point and don’t take forever to post. We’ve also come up with a way to focus them as correspondents with specific roles. 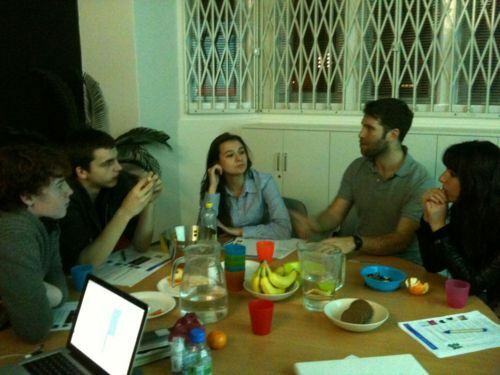 All have committed to posting AT the very LEAST, once a week and Jake has reached his 50th post as an SMJ – impressive! This week, Charlie, The SMJ’s and I took a trip down to The Guardian HQ in Kings Cross, courtesy of the lovely Benji Lanyado. We received the grand top-to-bottom tour of the impressively swanky – and as Bianca pointed out ‘corporate’ and ‘rather intimidating’ glass building – including the news room floor where the excitement of press deadlines looming was palpable, an ever expanding new media and digital department, a very impressive looking and smelling canteen, lots of stair wells and the BIG conference room furnished with BIG yellow sofa, where daily editorial’s happen.. The SMJ’s were lucky to meet with three editors, newly appointed Joanna Geary (Digital Development Editor) , Ian Prior ( Sports Editor) and David Madari (Comment is Free Editor), who gave up their precious time to explain to us all about the jobs they do and what they look for in a good writer and budding blogger..
* You will need an EXTRA something special. 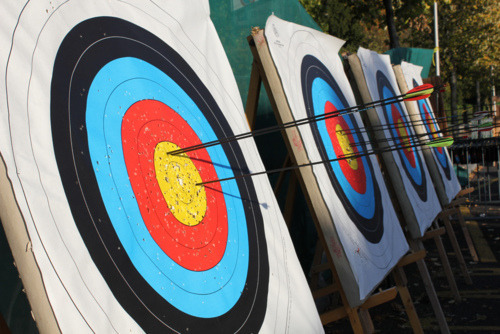 Become and expert in your field. * Be tenacious, don’t be afraid of rejection! * If you irritate an editor with your opinions, you are probably on the right track! * The future is DIGITAL! In short, become a Talented, Intelligent, Passionate, Stalker! Last Thursday, 20/10/11, armed with two lap tops, five flip cams and two good cameras, Bianca, Claudia, Jake, Kaspian, Charlie and myself, set off from our North East London homes, before the crack of dawn and headed for Heathrow airport, destination Geneva, Switzerland..
Our mission for the day was to travel to The Olympic Museum,Lausanne, the former home and work place of the founder of the Modern Olympic Movement, Baron Pierre de Courbetin to meet with the people who run it, to check out School’s Olympic week, and to find out a bit more about the history of the Olympic Games.. just what are the ingredients that make up an Olympic Museum? 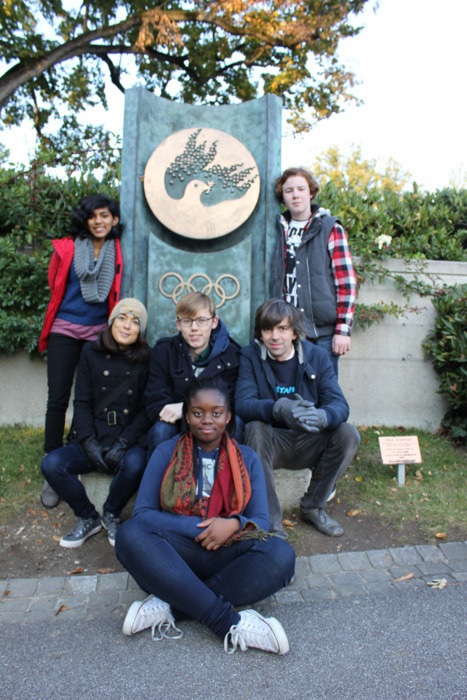 – we also had a date with Andy and Emily from London Organising Committee for the Olympic Games’s (LOCOG) Get Set Network to check out their ‘Welcoming the World’ exhibition which is currently on display there..
We managed to squeeze a lot in to a very long day.. Highlights include the lovely staff at The Museum led by Head of Education Anne Chevalley, and the endlessly knowledgable and incredibly good-natured museum guide, Karin Waldman who made herself at our disposal for the day, she took us on a truly fascinating and insightful tour of the permanent and temporary collections at The Museum and managed to make even the tiny facts, fascinating! 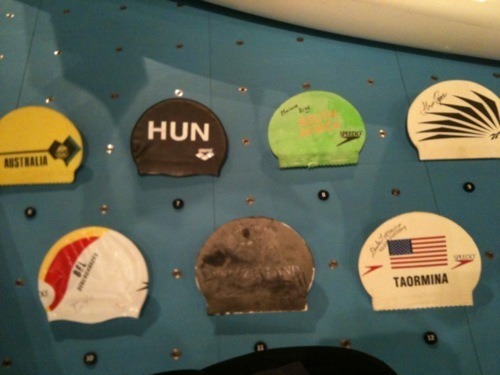 check out some swimming caps from former olympians from all over the world on display! 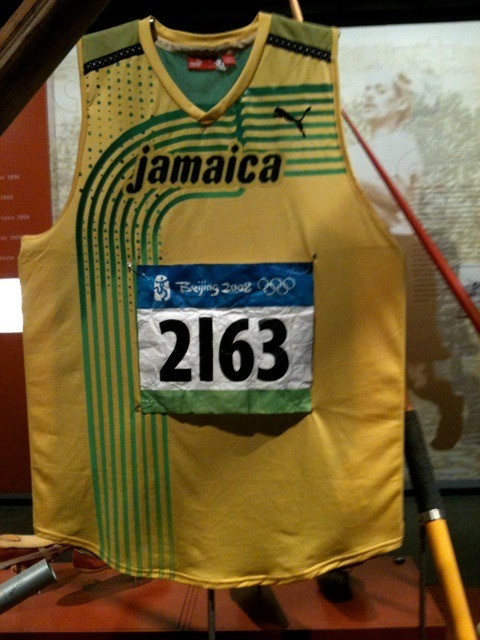 We also saw the shirt that Ussain Bolt won the 100 metres at The Beijing Olympics. We arrived home just before midnight, a weary but satisfied crew! ..
More about this trip to follow and to read other blogs from the SMJ’s, check out http://www.anewdirection.org.uk/socialmediajournalists and http://theheadstarters.wordpress.com/. Aquatics Centre – One Year to Go! Today, myself and two of the SMJ’s – Kimberley and Bianca have been invited down to the Aquatics Centre by BBC World Service to celebrate ‘One Year to Go’! Very exciting to be in the Zaha Hadid building which is truly beautiful and awe inspiring both from the outside and to be in.. Like entering a vast whale. Kimberley took to the media attention very comfortably and went from World Service Radio interview to World TV and back to Radio again with grace and confidence. She participated in ‘Have Your Say’, a conversational debate programme which included live speakers from Greece, Australia, Former Olympian and gold medallist Ed Moses, a Paralypian sprinter called Johnnie Peacock and Kimberley all poolside in London. They talked about all aspects of the build up to and the impact of a mega event like the Games coming to town, weighing up the pros and cons. 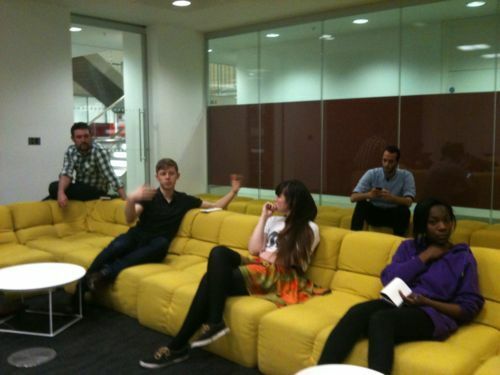 Kim was there to represent the voice of Young London and look specifically at Legacy . Kim was also interviewed for World TV (see pic) with a backdrop of the shiny new 50 metre pool – all good, apart from being called ‘Samantha’ by the presenter! Highlights so far apart from seeing and being in the building itself were watching synchronised swimming rehearsals, seeing Boris Johnson flurry past all mop of blonde hair and entourage, and meeting former American olympic athlete Ed Moses who reliably informs me that he doesn’t have any tickets either! Tom Daley due to christen the pool tonight with his first dive into it and Bianca in the hot seat this time for the world service.. watch out for more from both bianca’s blog and and Kimberley’s blog! Year to go fever and SHEDspace..
It’s officially a year to go till lift off and the SMJ’s are much in demand..
They’ve made podcasts for The Shoreditch Festival How does the Regents Canal where the festival is being held, connect to the local community and include them in the celebrations and events programmed to happen between now and 2012? Have a listen here and check out the festival. They’ve interviewed Director of The Cultural Olympiad Ruth Mackenzie about how the plans for the ‘Biggest party the Uk has ever hosted’ are shaping up.. Bianca interrogated her about her commitment to young people and the legacy that 2012 will leave behind for the next generation.. watch out for filmed interview to follow on Bianca’s blog. Some have expressed strong opinions about the fairness – or not – of the ticketing availability process in an online article for The Guardian. Joe has interviewed Paralympian hopeful for 2012 and 2016, Amy Marren who is a force to be reckoned with already at the tender age of 12. On Tuesday, Bianca and Kimberley are off to the Aquatics Centre to celebrate a year to go and take part in a day of broadcast by the BBC World Service. And today, we’re in a bright green shed at SHEDspace, part of Stratford Rising Festival doing research with the local folk of Stratford about what they think about the Olympics coming to town. Are they happy, excited about it? Have they got tickets? 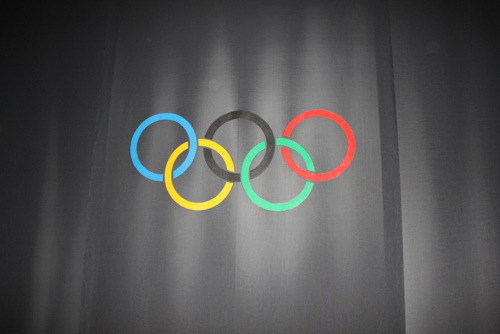 How will the Games benefit them and their families before and AFTER the Games ? Coming to a shed near you soon .. The SMJ’s have not gone fishing ..
but are all mainly heads down focussing on GCSE’s at the moment ..
We will be back, so do watch out for lots of summer action, festival programming, blogs, podcasts, an exciting residency at the School of Olympic Research with Charlie Tims and his Biglop Fest at A New Direction.